Has Mr Black created "the perfect digital delay" pedal? "It's not hard. It's not stiff. It's not sterile. It's just right." 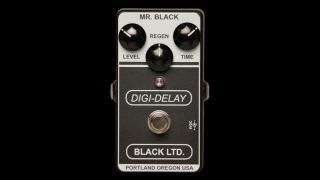 As creator of countless delay and reverb permutations, Mr Black knows his/its ambience, so when he/it says he/it has crafted "the perfect digital delay pedal", we listen: enter the LTD Digi-Delay. The pedal promises a highly tuned frequency response with slight top-end roll off and low-end cut, plus subtle modulation on repeats - or, as Mr Black describes it, "It's not hard. It's not stiff. It's not sterile. It's just right." 900ms of delay time is on offer, while self-oscillation is available on demand by cranking up the regen control - otherwise it's the same true-bypass, 9V battery operation as the rest of the Mr Black range. You'll have to head over to Mr Black to hear sound clips, but the pedal is available now for $179 as part of a limited run.